Like lots of the parks in Beijing, there are heaps of people just hanging out doing their thing in the morning or the evening. Lots of people have such small dwellings that you need to get out, and the parks are such a great social place to do things. We walked to Rittan Park and got there for 8am and thought we would have missed most of the activity but there were still plenty of people ballroom dancing, sword dancing, tai chi, rubbing against trees, doing funny walks with big strides or high kicks, one man keeping a ping pong ball in the air with a bat, slapping your body all over with either hands or fans etc, etc. 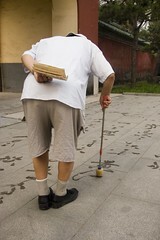 The guy in the picture was writing on the pavement using water and a long stick with a tear-shaped bit of foam on the end. His control was amazing at arm's length and his big stick. I remember doing life drawing with a short bit of stick with charcoal taped to the end and that was hard enough. This guy was varying the thickness of this stroke and placing the foam with such precision that I was speechless. The way the writing just slowly faded away with impermanence was very beautiful too. wow - some incredible pics so far. I bet you could watch this guy for hours. Any clue as to what he was writing? It described a sunset scene from the top of the tower building in Shan Xi province, by the Yellow river.